Every year around this time, I look forward to the new batch of Holiday movies gracing the big screens. This year, leading the list is the heartwarming Love The Coopers, a Christmas movie filmed in one of my favorite cities ... Pittsburgh, Pennsylvania. Directed by Jessie Nelson (I Am Sam), Love The Coopers features an A-list ensemble that includes Diane Keaton, John Goodman, Alan Arkin, Marisa Tomei, Olivia Wilde, Ed Helms, Amanda Seyfried, Jake Lacy, and many more. Love The Coopers brings four generations of the Coopers home for Christmas, each with his or her own set of problems. Filming in Pittsburgh was a wonderful experience for Ms. Nelson. "The nicest people I've ever met live in Pittsburgh," said the director. "The crews are top-notch. There's just a kindness to the people there that I haven't found in other places." One of the reasons that inspired Nelson to choose Pittsburgh as the filming location for Love The Coopers could be that her brother once lived there. The director talked CBS Films executive David Rubin into location scouting in Steel City, and Pittsburgh became another main character in the movie. — Jessie Nelson, Director of "Love The Coopers," on filming in Pittsburgh. "There's something really charming about Pittsburgh," Rubin said. "It's an inviting place where people would feel welcome and comfortable and connect with this family living here." When asked how she decided to film the movie in Pittsburgh, Nelson said the fact that Pittsburgh looks exactly like the setting she imagined for Love The Coopers worked in its favor. "I knew I wanted an eastern city — and yes, you have a remarkable [tax] rebate here . . . . And then they brought me here on a location scout, and it gave me everything I needed and then some. And it’s some of the kindest people I’ve ever worked with in this city; it was a very special experience shooting here." Love The Coopers was filmed in many local spots in Pittsburgh, including private homes in the town of Sewickley and Edgewood. The movie was also shot at Pittsburgh International Airport, a diner in Millvale, a senior community in South Fayette, Butler Memorial Hospital, Boyce Park, Gateway Center subway station, Frick Art & Historical Center, TGI Friday's at CONSOL Energy Center, Phipps Conservatory, the Galleria Mall in Mt. Lebanon, and various local grocery and electronics stores. — David Rubin, CBS Films Executive. On the Pittsburgh locations she used for filming, the director said Pamela's Diner in Millvale (where Seyfried's character "Ruby" works) is one of her favorites. She also loves filming in Sewickley and the Phipps Conservatory. "Because there were so many storylines, it took me into a lot of different neighborhoods and places," said Nelson. "It was a wonderful way into the city." — Beth Rubino, production designer for "Love The Coopers." The Pittsburgh house was chosen due to its expansive glass windows through which we can admire the snowy landscape outside. The Pittsburgh house used as the exterior for "Love The Coopers." Image via Google. The interiors, front porch and yard of the Coopers' home were all built on a Pittsburgh soundstage. 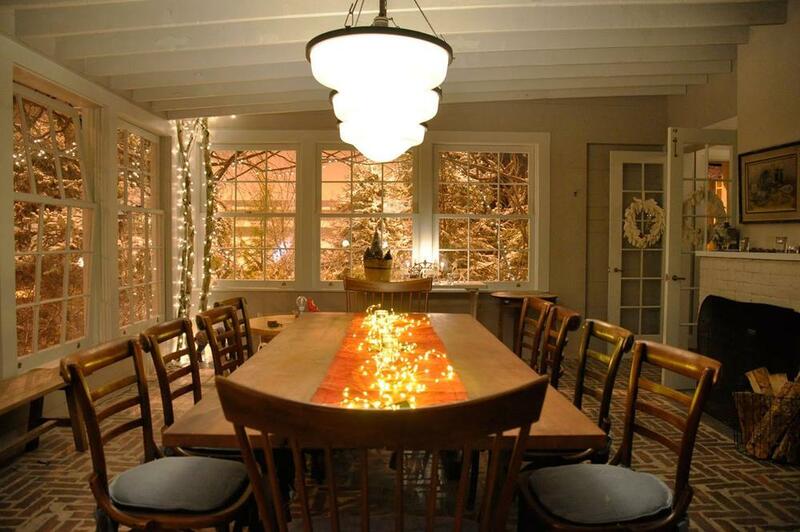 Since the family matriarch, Charlotte Cooper (played by Diane Keaton), collects snow globes, the home itself was designed to resemble a snow globe. The perfect Pittsburgh locations were not the only reasons Nelson wanted to film in the city. Two more factors helped tilt the scale toward the city for the director ... the hard-working local film crew, and the people of Pittsburgh. "The waitresses I met, the cooks I met — I couldn’t wait to put them in the movie, because they were just great people," said Nelson. "And the people here are particularly kind; there’s just a kindness in the air." Olivia Wilde is no stranger to Pittsburgh. She was there in 2009 filming the thriller The Next Three Days with Russell Crowe. One of the perks of filming in Pittsburgh was its close proximity to interesting landmarks. Ms. Wilde was able to explore the famous Frank Lloyd Wright home during her stay in the city. "We did get a chance to visit Fallingwater, which was amazing," shared Wilde. "It was gorgeous -- and really frozen. It's actually worth seeing frozen. I'd love to go back and go inside." Jake Lacy (Carol) enjoyed his time in Pittsburgh thoroughly. "I went to the Warhol museum, ate at a lot of good restaurants, went to Franktuary and hung out in Lawrenceville a little bit," said the Vermont native. "Mid-Atlantic Mercantile was very nice -- it had a little flavor of home, kind of a Brooklyn vibe there." For more information on filming in Pittsburgh, visit our client the Pittsburgh Film Office.